Do you know what relationship Zillertal has with Christmas? Or how American children came up with the name Santa Claus? What is the original name of the poem The Night Before Christmas? If you want to know the answers to these questions, no matter how old you are, you should read A Christmas Dictionary! Hardcover. With her trademark wit and humor, storyteller Dianne de Las Casas transports readers to an animal kingdom far, far away, where the pretty pachyderm, Ellaphant, lives with her odious step-mother and two ugly step-hippos. Aided by her fairy godmouse, Cinderellaphant is whisked away in a peanut carriage to foxtrot, bunny hop, and tango hoof to hoof with the charming zebra prince. Elephants may have a long memory, but it’s the prince who can’t get Cinderellaphant out of his head as he uses her gargantuan glass slipper to track her down. A true lesson in looking beyond the surface, this punny story will delight and entertain with its whimsical illustrations and charmingly told tale. Poo-yi! There is nothing more foul than the smell of a skunk, except for the harsh words of teasing children. They need to learn that people who are different from themselves are special in their own way, too. In the twelfth book in the Clovis Crawfish series, Mary Alice Fontenot has created a delightful story to emphasize this point to youngsters on and off the bayou. Clovis Crawfish and his friends share two adventures on this bilingual CD. Tracks include French and English translations. The skunk Batiste Bête Puante doesn’t mean to offend his friends, but the awful smell he gives off is actually one of his defenses. In this tale of a smelly tail, children learn about the heritage of the Cajuns and the importance of respecting the unusual abilities of others. It is late summer on the bayou, and the friends are sad because soon summer will be gone. The bayou friends are even sadder because it is time for Bertile Butterfly to leave. To wish Bertile bon voyage, Clovis throws a going-away party, complete with music and entertainment. 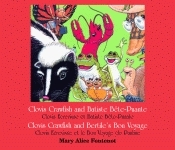 Clovis Crawfish and his friends share two adventures on this bilingual romp, including French and English translations. The skunk Batiste Bête Puante doesn’t mean to offend his friends, but the awful smell he gives off is actually one of his defenses. Bertile Butterfly must fly south for the winter with the other monarch butterflies, so Clovis throws a going-away party, complete with music and entertainment. It is late summer on the bayou, and the friends are sad because soon summer will be gone. The bayou friends are even sadder because it is time for Bertile Butterfly to leave. She must fly south for the winter with the other monarch butterflies and cannot stay in the bayou much longer. To wish Bertile bon voyage, Clovis throws a going-away party, complete with music and entertainment. All of the friends will be there—they all want to say good-bye to their friend Bertile. Clovis Crawfish and his friends share two adventures on this English/French bilingual CD. Bidon Box Turtle has only one problem. He is a Mississippi land turtle who wants to cross the bayou and not get his hat wet. “Kuk-kuk-kwak-kuk-kwak-kuk!” What could possibly make a sound like that in the Louisiana bayou?Whatever it is, it frightens Clovis’s friends, Christophe Cricket, Lizette Lizard, and René Rain Frog. 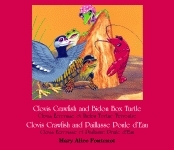 Clovis Crawfish and his friends share two adventures on this English/French bilingual download. Bidon Box Turtle is a Mississippi land turtle who wants to cross the bayou and not get his hat wet. “Kuk-kuk-kwak-kuk-kwak-kuk!” The sound wakes up Clovis Crawfish from a long nap and frightens his friends, Christophe Cricket, Lizette Lizard, and René Rain Frog. Parlez-vous français, Clovis Crawfish? Mais oui! Echo Gecko is the shy new lizard in the Louisiana swamp. She has a habit of repeating everything she hears, that’s how she got her nickname. All little Echo really wants is to learn how to speak French. Hardcover. Rain falls steadily on the banks of the bayou, turning the dirt to mud and causing the water to rise. But Etienne Escargot has barely noticed the rain—he has laid a mound of tiny, pearl-white eggs and is overwhelmed by his good fortune. Too late, he realizes he is marooned on a mud pile in a growing puddle. Can Clovis Crawfish think of some way to save the unborn snails? Clovis must: save his friend, Fédora Field Mouse and her children; deal with Madame Rat Musque, who likes to eat crawfish; and build a new house for himself. And children complain when they have math and spelling homework on the same night! Hardcover. Clovis Crawfish takes young readers on a journey through the bayou, his first of many adventures. Curious, Clovis begins searching for the reason his bayou is named “Tail of the Frog” and encounters many friends along the way, including Gaston Grasshopper, Lizette Lizard, and Fernand Frog. But friends are not the only creatures Clovis meets on his adventure, for the bayou is also home to many predators. When Clovis meets the hungry M’sieu Blue Jay, he needs to act fast if he wants to save everyone. Risking his own life for his loved ones, Clovis teaches the values of friendship.